So, you all know about the Sweet Science prints I've done. The limited edition prints are all going to be about 14" x 18" archival prints on beautiful cotton rag paper. They're stunning, believe me! They'll be strictly limited to 100, so when they're gone they're GONE! Well, I've decided to do a smaller, open edition version of the prints. These will be 8" x 10" giclée prints on a really nice heavy stock water color paper. I got a small batch of them in, and they're really fantastic! The ink is rated to last 200 years, and the water color paper really enhances the painterly quality of the prints. They'll be more affordable too, priced at 20 bucks. The REALLY good news is that I'll be taking pre-orders for the entire series, both open and limited edition, and offering a 30% discount on all the prints! I think I'll make the pre-order period about 2 weeks or so before I start sending orders out. Anyway, look for more about this soon. Haven't had a chance to check the stuff in a while, and damn there's alot of it to check. I tried to vote for you in that tee contest, but it wouldn't let me click 'vote now' for some reason. I figure either I missed the deadline, or I was doing it wrong. 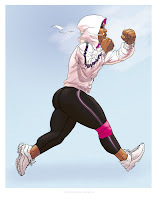 The sweet science stuff is nice, I love that Jogger, especially those tree trunks she's got on her. It's nice to see some current artists taking inspiration from real women, and doing it so well. Definitely makes me think of Khary's girl's, but a bit more bite to em, whereass his are more pinup. Great things all together. Hey, thanks man! I appreciate the kind words, and your trying to vote. The contest just ended, so you more then likely just missed it.